With an extraordinarily diverse repertoire, innovative programming and charismatic performance style, John Axelrod continues to increase his profile as one of today's leading conductors. 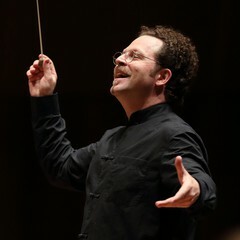 After successful tenures as Music Director and Chief Conductor of the Lucerne Symphony Orchestra and Theater, and as Music Director of the Orchestre National des Pays de la Loire, Axelrod currently serves as Principal Guest Conductor of the Orchestra Sinfonica di Milano Giuseppe Verdi, and from the 2015-2016 season, he serves as Artistic and Musical Director of the Real Orquesta Sinfónica de Sevilla (ROSS). From 2009 to 2012, he was Music Director of the "Hollywood in Vienna" Film Music Gala Concert with the ORF Radio-Symphonieorchester Wien, performed in the Wiener Konzerthaus. Axelrod has conducted over 150 orchestras around the world. He maintains relationships with many European orchestras, including the Rundfunk-Sinfonieorchester Berlin, Gewandhausorchester Leipzig, Dresdner Philharmonie, Orchestre de Paris, Orchestre National de Lyon, London Philharmonic, Royal Philharmonic, Orchestra dell'Accademia Nazionale di Santa Cecilia, Orchestra Sinfonica Nazionale della RAI Torino, Royal Stockholm Philharmonic, Danish National Symphony, Oslo Philharmonic, and many others. His international profile as guest conductor in the US and Asia features engagements with the National Symphony Orchestra, Los Angeles Philharmonic, Philadelphia Orchestra, Chicago Symphony Orchestra, NHK Symphony Orchestra Tokyo, Kyoto Symphony, and the Shanghai Symphony. His opera activity includes numerous productions at the Lucerne Theater, performances of Bernstein's Candide (directed by Robert Carsen) at Théâtre du Châtelet in Paris and the Teatro alla Scala in Milan, Wagner's Tristan and Isolde for the Angers-Nantes Opera (directed by Olivier Py), and the new production of Krenek's Kehraus um St. Stephan at the Bregenz Festspiele. Strongly committed to the promotion of contemporary repertoire, Axelrod has premiered many new compositions, including works by Kaija Saariaho, Wolfgang Rihm, Jörg Widmann, Michael Gordon, Michael van der Aa, Avner Dorman, Wojciech Kilar, and Gabriel Prokofiev, among others. His recordings include Gorecki's 3rd Symphony, and his most recent release is a cycle of Brahms Symphonies and accompanying Clara Schumann lieder, entitled Brahms Beloved. Axelrod graduated in 1988 from Harvard University. Trained by and in the tradition of Leonard Bernstein, he also studied with Ilya Musin. This is his second appearance at PMF since 2016.